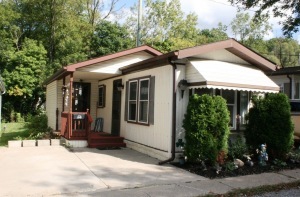 lovely 1 bedroom mobile home on gorgeous lot backing onto creek. located in niagara-on-the-lake, at creekside seniors estates, one of the finest and best run senior estates in all of niagara. this home 40' long and also has an attached porch. it has a kitchen with appliances included (a gas range); eating area; living room; bathroom and laundry room. there's a nice garden shed in the backyard by the creek. this trailer is to be elevated 18 inches in order to accommodate easier access to the utility connections below and, a new skirting is to be installed as well.